Drug-drug interactions are an important consideration in drug development. Induction of drug-metabolizing enzymes is an important mechanism underlying some drug-drug interactions. Increases in expression levels of important enzymes, such as the cytochrome P450 family (CYP) of enzymes located in the hepatic endoplasmic reticulum, can cause increases in the intrinsic clearance of many drugs, resulting in decreases in their plasma concentrations and in some cases a loss of efficacy. Thus, it is important to be able to find agents capable of causing induction early in the drug research process to identify those compounds most prone to this activity and select alternate agents that will lack this activity. Several types of assays have been described for this purpose, such as PXR binding assays and reporter gene approaches using engineered systems. 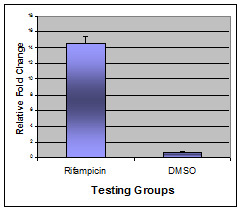 However, the use of human hepatocytes in testing for induction remains the most widely accepted approach for making in vitro assessments of induction, especially for informing clinical drug interaction study strategies and inclusion of data in drug registration dossiers and product labels. With the recent achievement of hepatocyte cryopreservation techniques, cells from individual donors can be tested for induction response using known positive control compounds and those providing the most robust responses can be selected for routine testing of new compounds. Master regulators of CYP450 induction such as the aryl hydrocarbon receptor (AhR), and the nuclear receptors pregnane X receptor (PXR) and constitutive androstane receptor (CAR), have been recognized as key mediators of drug-induced changes in the expression of CYP1A, CYP3A and CYP2B enzymes, as well as of phase II UGT enzymes and transporters (such as P-glycoprotein, P-gp). The FDA requires a clinical assessment of enzyme induction when a drug candidate, at pharmacologically-relevant concentrations, is 40% or more effective as the appropriate positive control. Studies have clearly shown that measurement of mRNA levels of drug-metabolizing enzymes and drug transporters represents the most sensitive markers for detecting drug-drug interaction in human hepatocytes. For brief preliminary screening, cells from one donor only may be well enough, but as the inter-individual variation in CYP activities between the donors may be large, cells from at least three donors is recommended by FDA and EMA for more accurate studies. 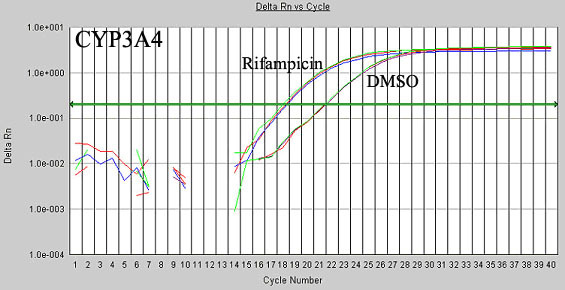 Currently MCLAB provides measurement assays for mRNA levels of targets listed as below based on quantitative real time reverse transcription polymerase chain reaction (qRT-PCR) method, and using Glyceraldehyde-3-phosphate dehydrogenase (GAPDH) as endogenous control. * At a minimum, an assessment of enzyme induction in uman hepatocytes should include CYP1A2, CYP2B6 and CYP3A4, as recommended by the FDA and EMA. ** Although as an non-inducible enzyme, CYP2D6 can be included as part of an enzyme induction study. FDA (2012): DRAFT Guidance for Industry Drug Interaction Studies Study Design, Data Analysis and Implications for Dosing and Labeling. EMA (2012): DRAFT Guideline on the Investigation of Drug Interactions.